Sky high, go as high as possible but beware, there are dangerous obstacles on our way to become the best sky high flying Pegasus ever known. Jump high using the White clouds, but beware, there are Dark Clouds that disappear con contact, on those you can only jump once! 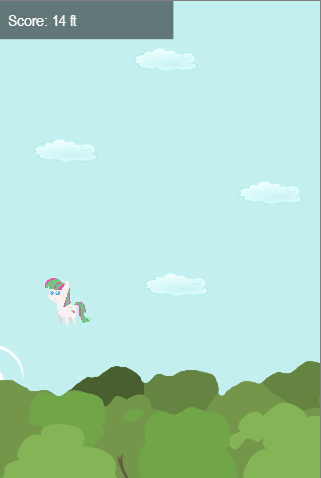 Not to mention the Shadow Bolts those pesky dark Pegasus wont let you pass trough them you have to jump over them! 70 megs for such a little game? Really? I mean, dude, there is only two music themes (at least that is what the jukebox shows me) and sprites don't really have that much animations. So... really? Doodle Jump is 4 megs or so, so why the bloody hell this game is 70? Not that it is such a big problem, but downloading 70 megs to play the game for a few minutes is a bit of an overkill, don't you think? The Linux64 version complains about not finding a libudev.so.0 file. Ok, i see the problem of Linux x64. it seems its an internal error of the compiler so until i can fix that linux x64 will not be available. Linux x86 it's working fine for me. also the Mb's of download has reduced to a 60% or more. Fixed, downloads are now 27mb's to 33mb's depending on version. the reason it still weight's more than doodle jump it's simple. well there a re various reasons, some of them are: internet connectivity module, inner save space, node app (pc-linux-mac versions). the resources only use around... 2.7mb's. so it's the node and phonegap resources problem, not the game itself. 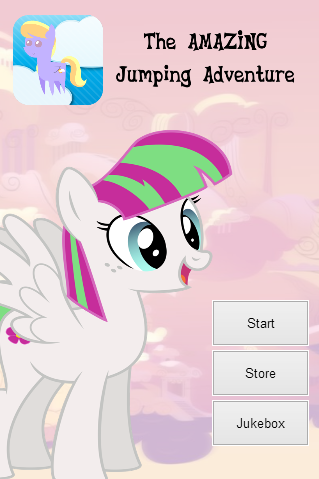 I'm really curious about all the pony fan games on iOS. There's a bunch (both good and bad) and I want to know how they don't get taken down by Gameloft or Hasbro when they feature trademarked characters. Does Hasbro only consider C&D if it becomes popular? I'm starting a mobile pony game myself soon but I was going to use only OCs to stay safe. What's your take on this? (09-22-2013, 05:45 PM)Nuke928 Wrote: The Linux64 version complains about not finding a libudev.so.0 file. As for the game itself, not much I can say about it since it's so simple. The two score-related things in the store aren't really useful for anything, and if you care about high scores, you'll want to buy them every time which means no real decision-making, just a boring clicking chore. If you want a shop in a game like this, it should either have things that help you out somehow, or cosmetic things such as unlockable ponies, but buying score with score is pretty much pointless. im retaking development to reduce download size, add more features anf fix the broken cloud spawn module. I had the same problem with the Linux64 version (Ubuntu 14.04 here), but managed to fix it using Xinef's method (I hope it doesn't break anything, though).